Mennonites believe that Jesus Christ belongs at the center of a life of faith and that it is possible by God’s Spirit to follow Jesus’ teachings in daily living. Some special Mennonite emphases are: peacemaking, nonviolence, voluntary service, community interdependence, mutual economic support, and reading the Bible together. Where did the name Mennonite come from? Mennonites are a branch of the Christian church. Part of the group known as Anabaptists (because they rebaptized adult believers), the Mennonites took their name from Menno Simons, a Dutch priest who converted to the Anabaptist faith and helped lead it to prominence in Holland by the mid-16th century. Modern day Mennonites number almost 1 million worldwide, with churches in North and South America, Africa, Europe and Asia. Mennonites are known for their emphasis on issues such as peace, justice, simplicity, community, service, and mutual aid. 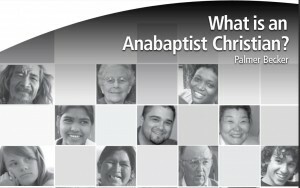 What have been unique Anabaptist Mennonite emphases? In regard to the issue of whether people are saved by faith alone or by doing good deeds or “works:” Anabaptists understand that it is by faith we are saved, but that being in right relationship with God is tied to a transformed lifestyle. In regard to how truth is to be understood: The Anabaptists emphasize that Scripture, rather than tradition holds final truth. The Anabaptists place the authority for understanding truth from Scriptures in the gathered disciple-community led by the Spirit, rather than in the interpretation of the scholars and magistrates. In a time when the government made religious decisions for the people, the Anabaptists believed in religious freedom, or free choice without government interference or mandates from religious institutions. The Anabaptists choose peacemaking and dialogue rather than war and inquisition as the way to settle conflicts. Ultimately we are not so concerned with being Anabaptist, Catholic, or Protestant, but simply being faithful disciples of Jesus! (Answer Credit: Third Way Café). How are Mennonites different from Amish? The Amish, who separated from the Mennonites in the late 1600′s, are widely known for their plain dress and rejection of modern technology and conveniences. Unlike the Mennonites, they form an exclusive and tight-knit community, with the church dictating much of what may or may not be done: for example, each local church district would dictate rules regarding the use of telephones, if indeed they are permitted at all. While certain conservative branches of the Mennonite church still dress simply and require women to wear head coverings, Mennonites generally are not culturally separatist, choosing to embrace the larger communities outside of their church rather than forming a separate community around the church. Where the Amish believe in keeping themselves spiritually focused by limiting their interaction with modern society, Mennonites believe in practicing Jesus’ teaching of service to others in a broader context.